When Gossips reported it two weeks ago, it was a rumor that turned out to be not true. Just an hour ago, however, the Register-Star reported that Quintin Cross has turned himself in, after a month and a half of being "on the lam." Tomorrow is the first day of May, and May is National Preservation Month. The theme for Preservation Month this year is "Discover America's Hidden Gems." The National Trust for Historic Preservation is encouraging people to explore and discover the hidden architectural gems in their communities and share their discoveries with others. 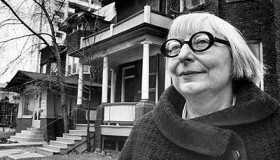 May is also the month--particularly early May, near her birthday on May 4--when people celebrate the life and work of Jane Jacobs, who helped save neighborhoods from destruction at the hands of outside interests and championed a community-based approach to city building. The form the celebration of her birthday typically takes is Jane Jacobs Walk, an event that gets people to walk, observe, and connect with their cities. 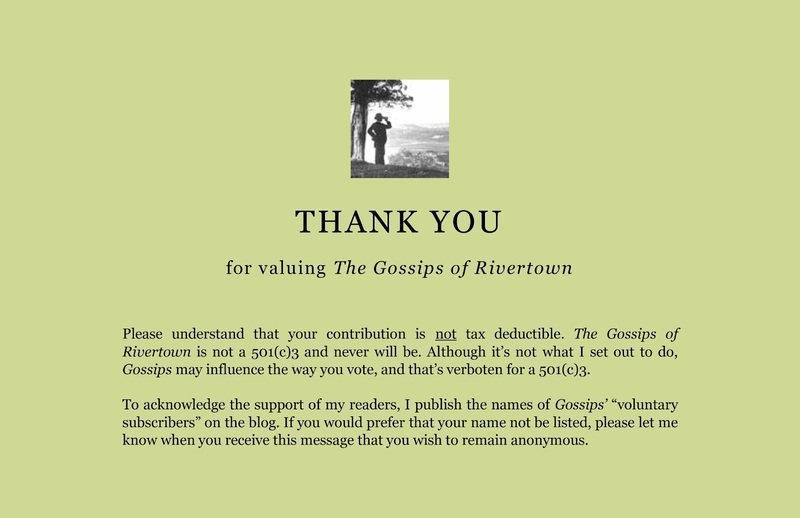 In support of both Preservation Month and Jane Jacobs Walk, Gossips intends, throughout the month of May, to publish a new post each day calling attention to some detail of the built environment of Hudson. The post might comment on an unusual architectural feature or element. It might talk about the architect who designed a particular building or the circumstances surrounding its construction. It might recount some bizarre or historically significant thing that happened in a building, or tell about noteworthy people who lived there or frequently visited there. The series will be called "Jane's Walk," because, by pointing out things that may have gone unnoticed and offering information to pique the curiosity, the goal is to inspire you to go out and have a look for yourselves--to walk, observe, and connect with our little city. In the process, you may discover other hidden gems to share with the Gossips audience. 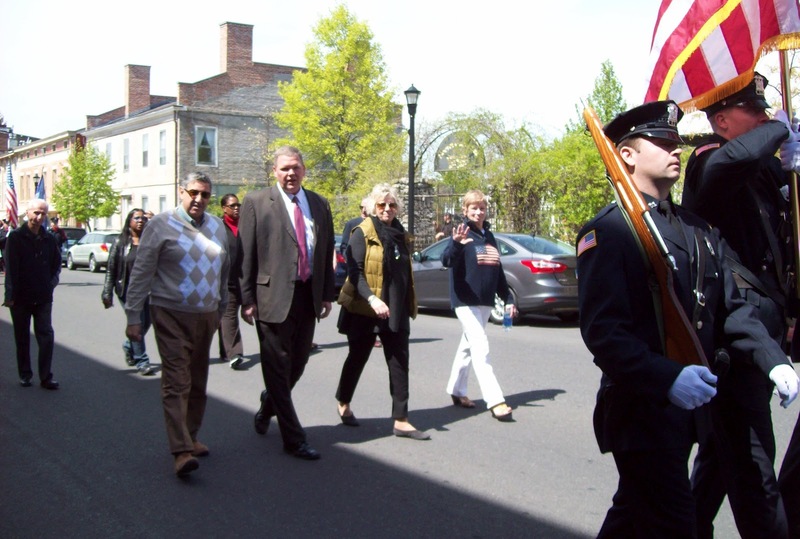 Look for "Jane's Walk" features to appear every afternoon, beginning tomorrow, Tuesday, May 1. 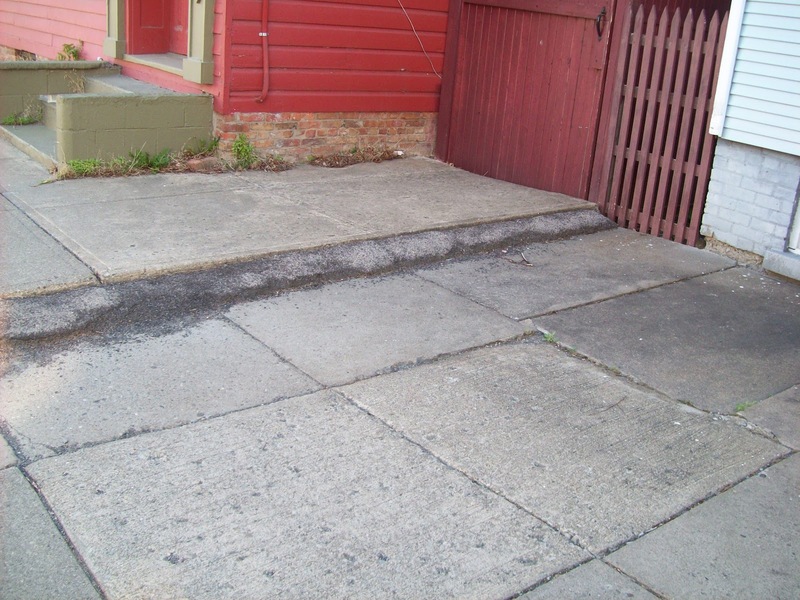 At the last Public Works Committee meeting, DPW Superintendent Rob Perry told the committee that, as part of the recent improvements to City Hall, the front doors are to be replaced. Wouldn't it be grand if the new doors could somehow replicate the doors that were originally on this magnificent building? A reader recently told me that the building we fondly remember as the General Worth Hotel didn't always have that name. 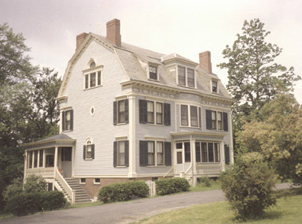 In the beginning, it was known as Badgley's Mansion House. Although I was surprised to hear this, it makes perfect sense. 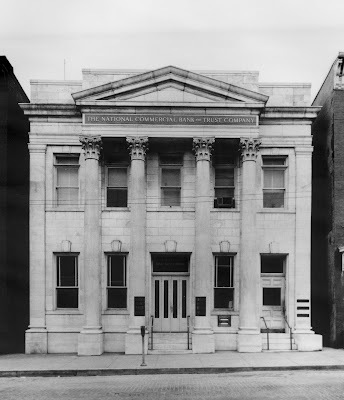 The Greek Revival building that became known as the General Worth Hotel was built in 1837. At that time, William Jenkins Worth was building a reputation as a military tactician, but he wasn't yet the national hero that he would ultimately become. In 1837, Worth was fighting the Second Seminole War in Florida (1835-1842), during which, in 1838, he was promoted to colonel of the Eighth Infantry. Worth achieved the rank of major-general, his highest rank, in 1846, during the Mexican-American War (1846-1848). When the war was over, he commanded the army's Department of Texas and died of cholera in San Antonio on May 17, 1849. After his death in Texas, Worth's body was temporarily interred in Brooklyn, and on November 25, 1857, he was buried, with great ceremony, beneath this monument at the intersection of Fifth Avenue, Broadway, and 25th Street in New York City. The ceremony included a procession that involved no fewer than 6,500 soldiers. It seems likely that, after all the pomp and circumstance in New York City, it occurred to folks in Hudson that it might be a nice idea to name the city's major hotel after its most illustrious native son. All this background is by way of introduction to two advertisements that appeared in Hudson newspapers in 1842. Both make reference to Badgley's Mansion House, and both provide a little window into what life was like 170 years ago. COFFINS, SHROUDS, &c. -- The public will please bear in mind that the only regular assortment of Coffins, Shrouds, Caps, Collars, Coffin-plates, &c. kept in this city, is at HEDGES' OLD STAND, opposite Badgley's Mansion House, and for cash, the cheapest. LEECHES! LEECHES! -- Very fine, healthy European Leeches, just receeived and for sale, or carefully applied, by MORRIS DWIRE, next door above Badgley's Mansion House. I haven't shared a story about William in a while, so, since many of you have told me you enjoy them, here's one for the day after the first parade of the season in Hudson. William went with me to the Inspection Day Parade yesterday. He doesn't particularly like parades, but he likes being out on sunny spring days, so I figured I'd take him with me to the parade. Lick had announced they would be open yesterday and today--for the first time this season--and I thought we might get some ice cream after the parade, but William had other ideas. As we passed Lick on our way to the 300 block, where I thought we would watch the parade, William bolted through the shop's open door. So we got our ice cream first and settled on a bench out in front to enjoy our sweet indulgence and wait for the parade. 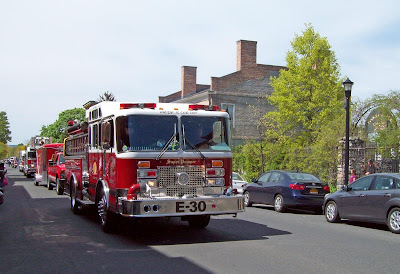 Once the ice cream was eaten and the Hudson fire companies and their trucks had passed, William was ready to move on. We took advantage of a break in the parade to cross over to the sunny side of the street, where we walked along for a while, keeping step with the parade. Just beyond the PARC Park, William started behaving like a spooked animal. 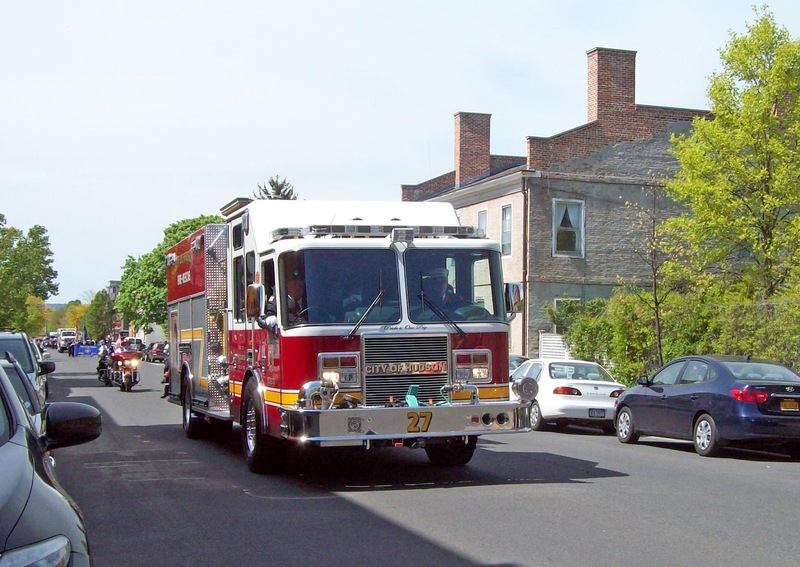 He tugged at the leash, wanting to cross the street, but there were firetrucks in the way. Finally, there was another break in the parade, and we headed across. That's when I heard what William was already hearing: bagpipes! William hates bagpipes. They are the principal reason he dislikes parades. 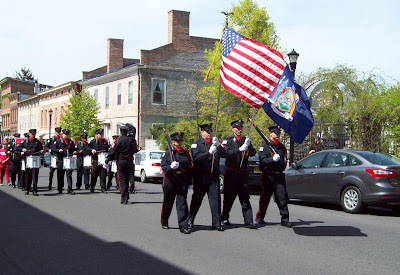 Years ago, I took him to a Flag Day parade. That day, we settled down to watch the parade directly across the street from Rural Residence. 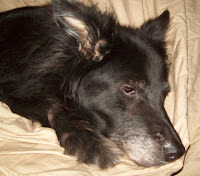 When the bagpipes approached, William started howling as if in pain and made a beeline for home, tugging me behind him. 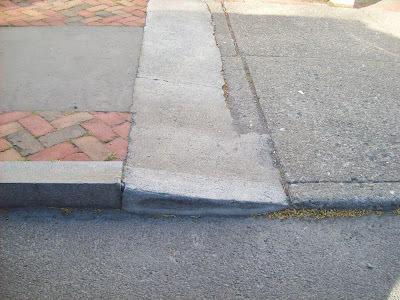 We headed south and west, through the municipal parking lot, diagonally across the alley, through the Youth Center parking lot, over the lawn, and jaywalked across Third Street--pursuing as straight a course for home as possible. It amazed me that a dog who'd only ever been walked on sidewalks could instinctively find the shortest distance between two points--in a city, where buildings got in the way. Yesterday, instead of racing home at breakneck speed, we took refuge from the sound of the bagpipes at Hudson Wine Merchants. I needed a bottle of wine, and Michael Albin, who knows about the canine aversion to bagpipes, kindly let us hang out there until the pipers had passed. Doggone! Is the Dream of a Dog Park Gone? 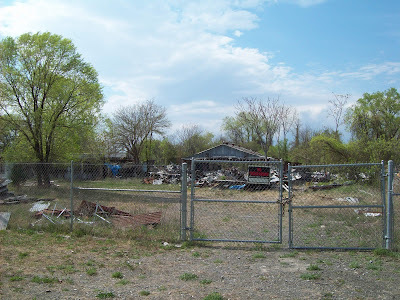 Last Sunday, Gossips reported about a plan to turn the brownfield site that was Foster's Refrigeration into a dog park. All that was required for the transformation from brownfield to dog park was to complete the demolition, remove all the debris, and bring in new topsoil. 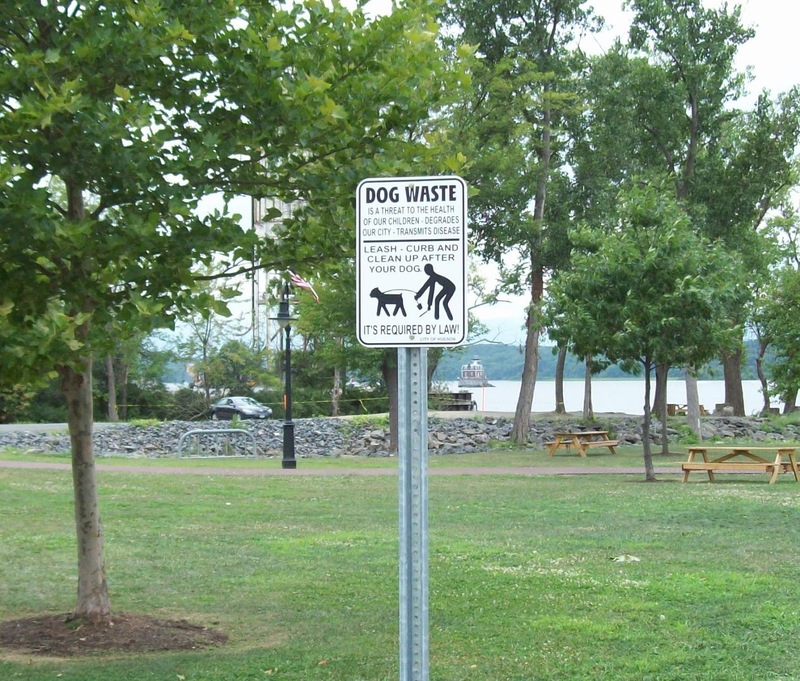 It seemed the City of Hudson was willing to do that to eliminate an eyesore and provide some open space where a group of interested dog owners could develop a dog park. 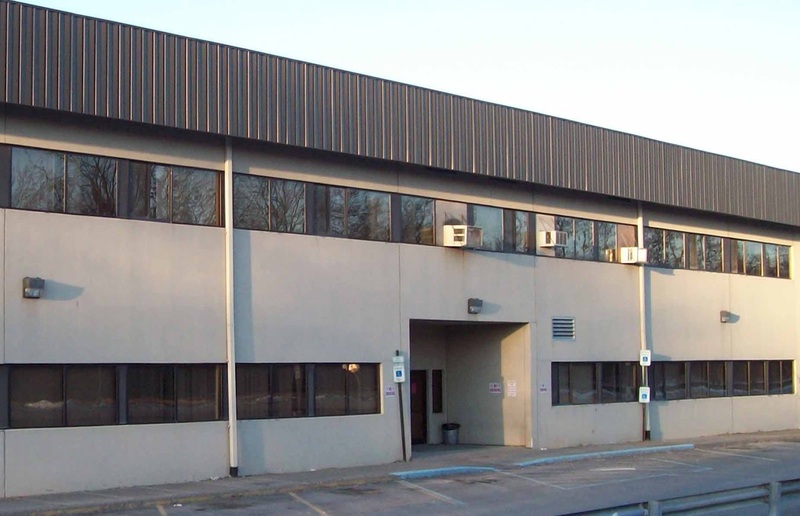 The City made a formal request for bids on the demolition, and at last Wednesday's Public Works Committee meeting, DPW Superintendent Rob Perry reported on the bids received. They ranged from $120,000 to $228,440--the lowest being, according to Perry, twice what anyone imagined it would cost. It is not yet known what the City's next steps will be in addressing the brownfield or how the unexpectedly high price tag for demolition will impact plans for a dog park. 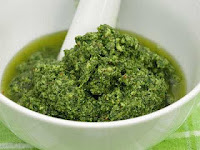 Hungry in Hudson has a new post about pesto and provides recipes for varieties of pesto made with ingredients available right now--leeks, garlic scapes, green olives, and ramps: "I love pesto, in so many ways." While searching the Internet for this picture of pesto, I discovered a blog called DOCAITTA (Devoid of Culture and Indifferent to the Arts), which offers recipes for, among others, spinach pesto and arugula pesto. Coming up in May or perhaps June, the Department of Public Works will be auctioning off unused equipment, including a couple of fairly new trolley buses. Although the average person may not have need for a trolley bus, the auction does include something that might appeal to many: fire alarm boxes. There are about thirty of these boxes which were once installed around town and used for summoning the fire department. Because of their potential appeal to collectors of firematic memorabilia and unusual objects and to people who just want to own a little piece of Hudson history, DPW Superintendent Rob Perry has decided to auction the boxes separately rather than as one lot. Later this morning--at 10 a.m.--the Indoor Farmers' Market at Christ Church will open for the last time this season. During the course of next week, the Department of Public Works will be busy painting the big orange carrots on the street, marking the way to Sixth and Columbia streets, because next Saturday, May 5, the outdoor Hudson Farmers' Market returns for its six-month run, through the spring and summer and into the fall. This year the Hudson Farmers' Market is celebrating its fifteenth anniversary. With the addition of six new vendors, a total of thirty-two vendors will be at the market this year, offering a wide variety of locally grown organic and non-organic vegetables and fruits, mushrooms, pasture-raised meats, free-range chicken and eggs, fresh seafood, milk in glass bottles, bread and other baked goods, locally produced beer and root beer, honey, salsas and jams, flowers, and crafted items. There's a big celebration planned for Saturday, May 12, to mark the market's fifteenth year. Lots of local dignitaries are expected to be on hand, as well as one of the market's founders, Dr. Norman Posner. The Hudson Farmers' Market is open from 9 a.m. to 1 p.m. every Saturday. The celebration on May 12 begins at 9:30. 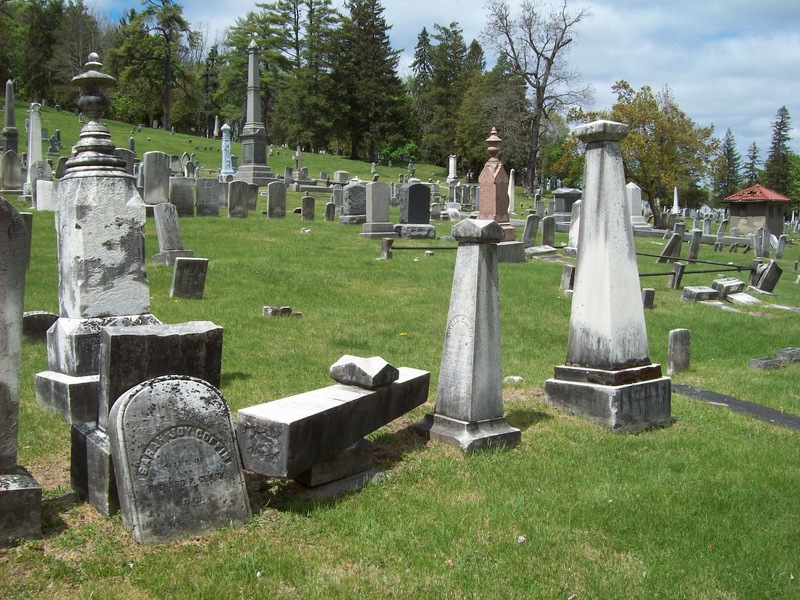 It's an attitude encountered in many places in upstate New York, and one that often seems particularly virulent in Hudson: unless you have ancestors buried in the local cemetery, you never stop being a newcomer and (implied) an outsider, an interloper, a "citiot." A Gossips reader told me this morning that his aunt, who seems to be the family genealogist, had discovered that he was a direct descendant of Tristram Coffin, who founded Nantucket. Doing some further research on his own, he discovered that another Coffin in this direct line of descent was Alexander Coffin, who was one of the Proprietors--the founders of Hudson. This reader and his wife bought a house here in Hudson a few years ago, and now divide their time between Hudson and New York City. By some standards, they are "newcomers"; but by the "ancestors in the cemetery" test, they are not. He has lots of ancestors buried in the Hudson cemetery--some of whom have been there for close to two hundred years. Next Saturday, May 5, the Ramp Fest returns for its second year at Basilica Hudson. 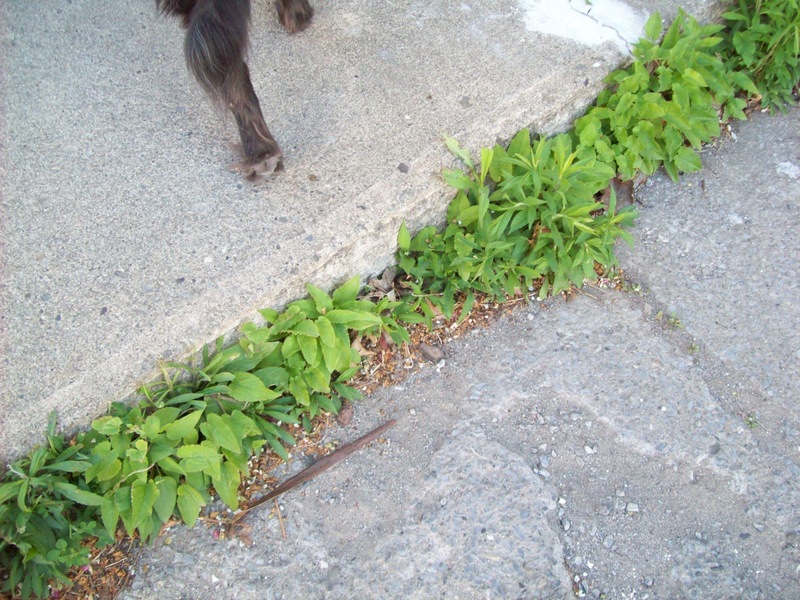 The ramp, known for its garlicky odor and oniony taste, is an early spring vegetable associated with myth and mystery in the folklore of the central Appalachian Mountains. It is believed to be a potent tonic to purge the many ailments of winter--spiritual, we would imagine, as well as physical. For an admission fee of $20 ($10 for children 10 and under), attendees are invited to "indulge in the weird and wonderful veggie and sample all the ramp dishes they can stand." There will be a cash bar selling potables to pair with the ramps. Participating restaurants are: from Hudson, Swoon Kitchenbar, DA|BA, Loaf, Cafe Le Perche, and Truck Pizza; from New York City, Fatty Crab and Fatty 'Cue, Sfoglia, Cookshop, and Hundred Acres; from elsewhere around here, Another Fork in the Road in Milan, The Farmer's Wife in Ancramdale, The Red Onion in Woodstock, Panzur in Tivoli, and Miss Lucy's Kitchen in Saugerties. The Ramp Fest begins at noon and goes on until 4 p.m. To buy tickets in advance, go to rampfesthudson.com. 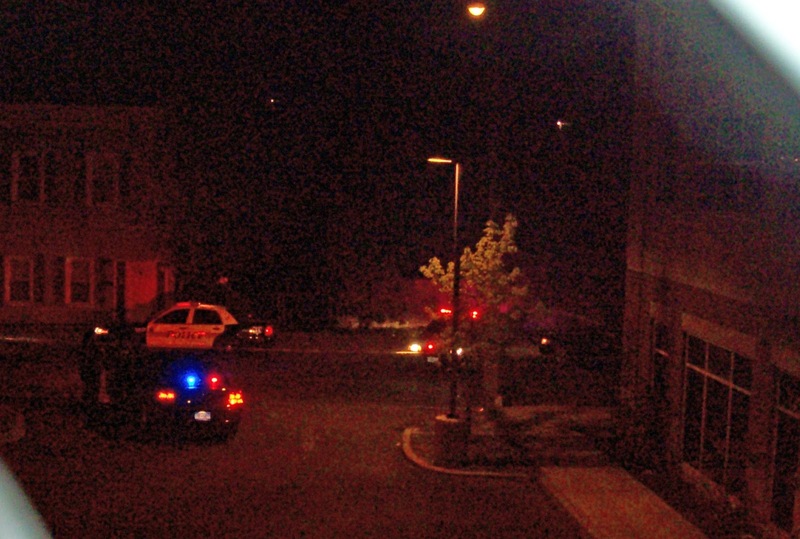 Nathan Mayberg has the story of last night's incident on Columbia Street in the Register-Star: "Man shot in Columbia St. home." The location of the shooting was 310 Columbia Street, a building owned--and offered for sale--by Phil Gellert. The Planning Commission tonight gave unanimous approval to the site plan for an outdoor food court and beer & wine garden at 347 Warren Street--a decision that was greeted with applause from the audience assembled at City Hall. After some public comment in which mention was made of visitors and weekenders from New York City, Michael Davis, the owner of the site and the applicant, stressed that he was "seeking to create a community center and not [primarily] to appeal to visitors and second home owners." Since the project is located in a locally designated and National Register listed historic district, the next stop for the project is the City of Hudson Historic Preservation Commission. The project will also need a permit from the New York State Liquor Authority. Still, it's pretty certain that Hudson can look forward to dining outdoors on balmy summer evenings, with a choice of Mexican, Indian, and Thai cuisines, or what we've co-opted as American cuisine: pizza! When leaving Club Helsinki tonight at about 10:30, after Dining Out for Life with friends, Gossips encountered a Greenport police car blocking access to Columbia Street below Fourth Street. When asked what was happening, the officer explained that there was an "incident" farther down on the block but would give no information about the nature of the incident. Gossips then asked, "Why are the Greenport police here? Don't we have enough police officers in Hudson?" The officer responded, "They're calling everybody in." Heading home, Gossips circled back and snapped this picture from Prison Alley, through a chain link fence, just west of the county office building at 325 Columbia. It appears that at least three Hudson police cars had converged on a building on the north side of Columbia Street, either 308 or 310, both of which are owned by Phil Gellert. 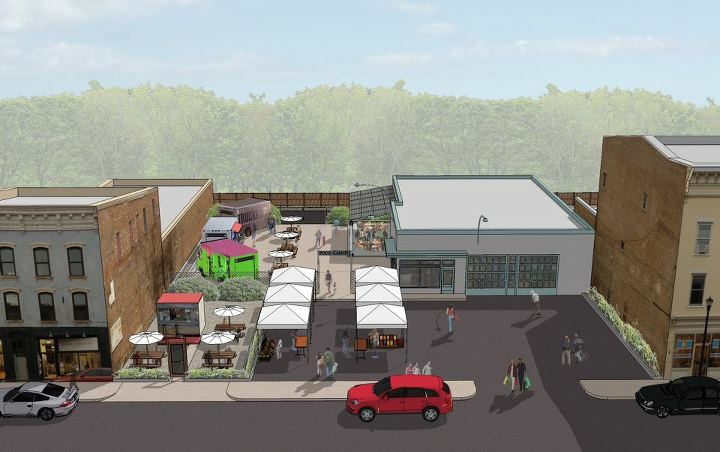 Tonight at 7 p.m. at City Hall, the Planning Commission resumes the public hearing and site plan review of the proposal for an outdoor food court and beer & wine garden at 347 Warren Street. Last night at the Common Council Public Works Committee meeting, DPW Superintendent Rob Perry spoke about the Archives Grant the department has to digitize its records. 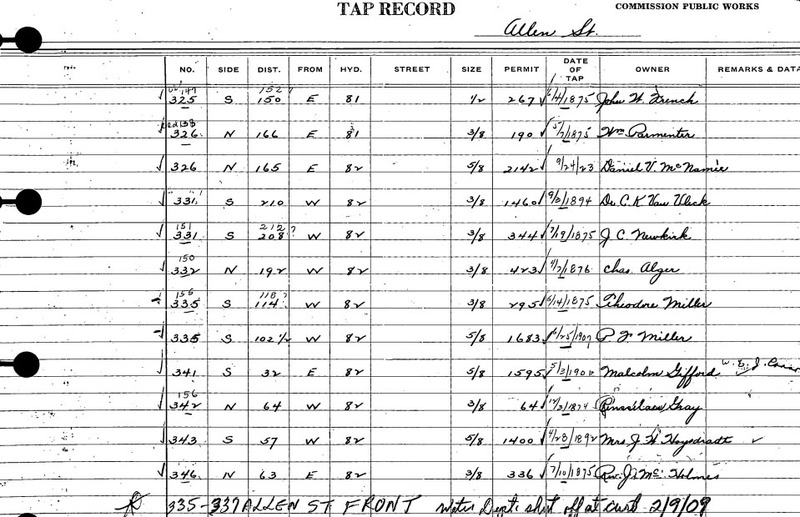 One such document is now available on the City of Hudson website: the Tap Record. 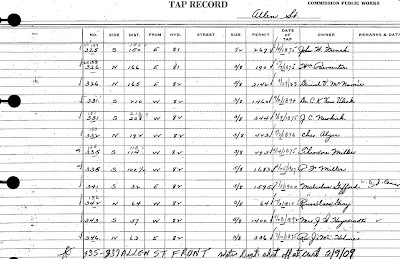 If you're curious about when your house was hooked up to the public water supply and who lived there when it was, the Tap Record will tell you. But its greatest value may be that, although it uses the current house numbers, it notes the original number of each house on the west-east streets, before 1888 when the numbers were changed to create hundred blocks. At last night's Common Council Legal Committee meeting, committee chair John Friedman (Third Ward) suggested it was time the City got serious about making people abide by the pooper scooper law and pick up after their dogs. 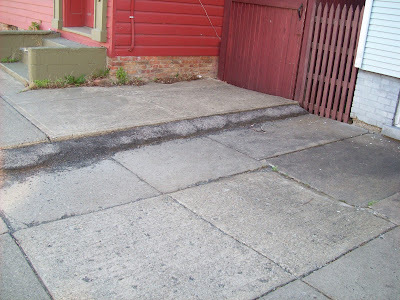 He proposed an amendment to Section 70-11 of the City Code which would make the fine for ignoring the pooper scooper law $250 for the first offense, $500 for the second, and $1,000 for all subsequent offenses. Friedman said he believed the tougher fines would be an incentive for people to obey the law and clean up after their dogs. This year, the 157th Annual Firemen's Inspection Day Parade will proceed upstreet (and uphill) on Warren Street instead of downstreet. Far from being an unprecedented break with tradition, the new route seems to be a return to the parade routes of yesteryear. A reader provided these pictures of an Inspection Day Parade in the 1950s. They were taken at the intersection of Warren and Third streets. Notice the awning on 260 Warren Street, the barber pole at 302 Warren, where The Bee's Knees is now located, the streetcar tracks, the cobblestones, and that car with the remarkable tail fins. Victor Mendolia has published his sixth and final post about his experience living in a building owned by Eric Galloway: "The Wrap Up." 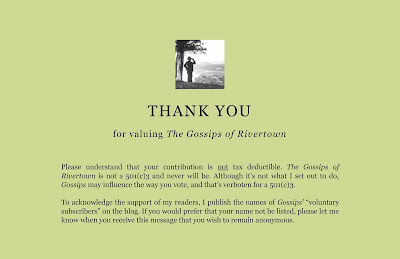 Included there is a link to this morning's @Issue on WGXC in which Mendolia, interviewed by the voice of The Gossips of Rivertown, recounts his story and then talks with Debby Mayer and me about the Galloway's impact--past, present, and future--on Hudson. 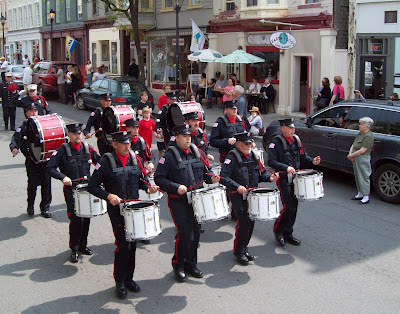 Back in January, it seemed there might not be an Inspection Day Parade this year. 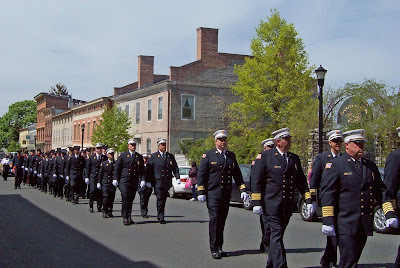 The Hudson Fire Department bemoaned the low attendance at the parade and contemplated discontinuing it. 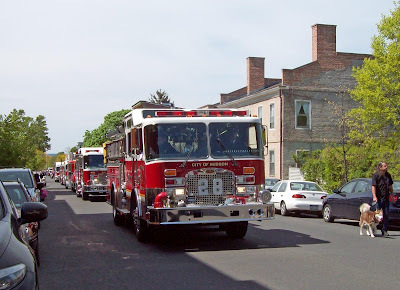 Happily, instead of abandoning this grand Hudson tradition, which dates back to 1856, the Fire Department decided instead to change the parade route. 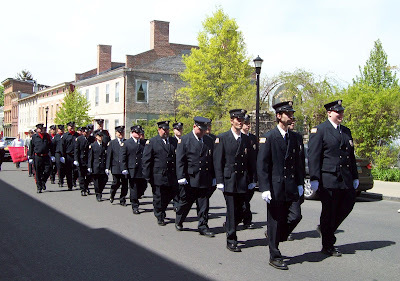 This Saturday, April 28, the four volunteer fire companies of Hudson and volunteer fire companies from around the county will don their dress uniforms and parade up Warren Street, accompanied by snappy drum lines and gleaming fire engines--both vintage and modern. 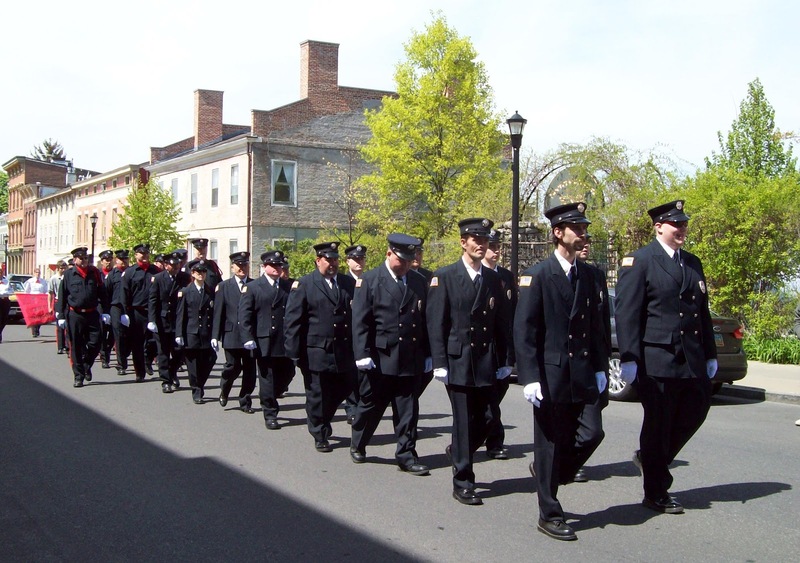 The parade steps off at 2 p.m. from Warren and Front streets and moves up Warren to Seventh Street. At Seventh Street, the parade turns left and proceeds to the Central Firehouse. But before you stake out your place on the sidewalk this Saturday and prepare to enjoy Hudson's oldest parade, you can learn about becoming part of Hudson's newest parade: the Hudson Pride Parade. 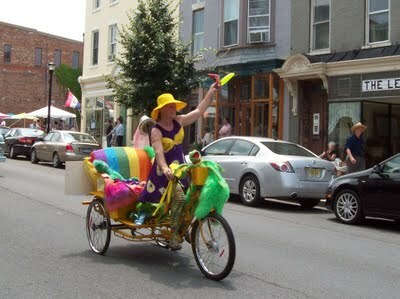 At noon on Saturday, the Hudson Pride Foundation is planning a parade volunteer meeting at 554 Warren Street. People are invited to come and find out how they can be part of the fun when the Pride Parade takes to the street on Saturday, June 16. Nathan Mayberg has an article in today's Register-Star that probes the murky history of 25 Railroad Avenue and explains the details of Concra's lawsuit against the Hudson IDA: "Title to DSS Property Held by Hudson IDA." 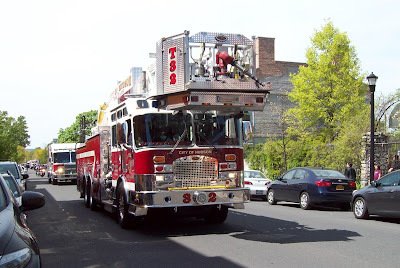 Victor Mendolia has posted Part 5 in his series about his experience living at 336 West 19th Street: "Putting It All Back Together and the Electrical Problem." Mendolia will be talking about his experience on @Issue on WGXC 90.7 FM at 10 a.m. tomorrow. According to NPR this morning, the Republicans were hoping for a strong turnout in the five primaries in the Northeast today--New York, Connecticut, Pennsylvania, Rhode Island, and Delaware--but if the action at St. Mary's Academy is any indication, their hopes weren't realized. In the First Ward, which has 37 registered Republicans, only 1 voter showed up; in the Second Ward, which has 73 registered Republicans, only 4 voters came out; and in the Third Ward, where there are 106 registered Republicans, only 13 came to the polls. Slides from several of the presentations made at the April 13 forum, which took place on April 3 at Columbia-Greene Community College, can now be viewed on the Scenic Hudson website. 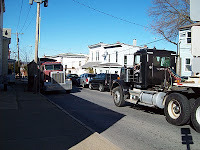 Timothy O'Connor has a letter to the editor in today's Register-Star about the proposal to move the truck route and the new truck route task force, which seems to have borrowed its title from The Gossips of Rivertown: "Truck Talk." The Register-Star reports this morning that Anthony Concra, who has, since 1991, been collecting $425,000 a year from the county for 25 Railroad Avenue and is now negotiating to sell the building to the county for something upwards of $1 million, is suing the City of Hudson Industrial Development Agency and Columbia County, alleging, it seems, that since the twenty-year PILOT agreement with the Hudson IDA ended in 2010, the property has been overassessed and overtaxed. Last night the Common Council met in executive session to discuss the new police contract. While the Council deliberates, Gossips decided to share this photograph of the Hudson Police Department taken, judging from the police car and the paddy wagon, in the early 1930s. It would appear that the police department, then headquartered in the part of the old City Hall that now houses the offices of the Hudson Opera House, was made up of six men who served a population that numbered, according to the 1930 census, 12,337. 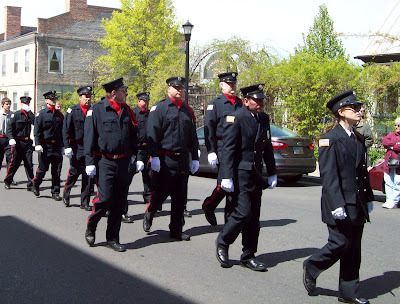 Today, the Hudson Police Department has something like twenty-four officers, not including the people who monitor the parking meters, and the population of Hudson, according to the latest census, is 6,713. 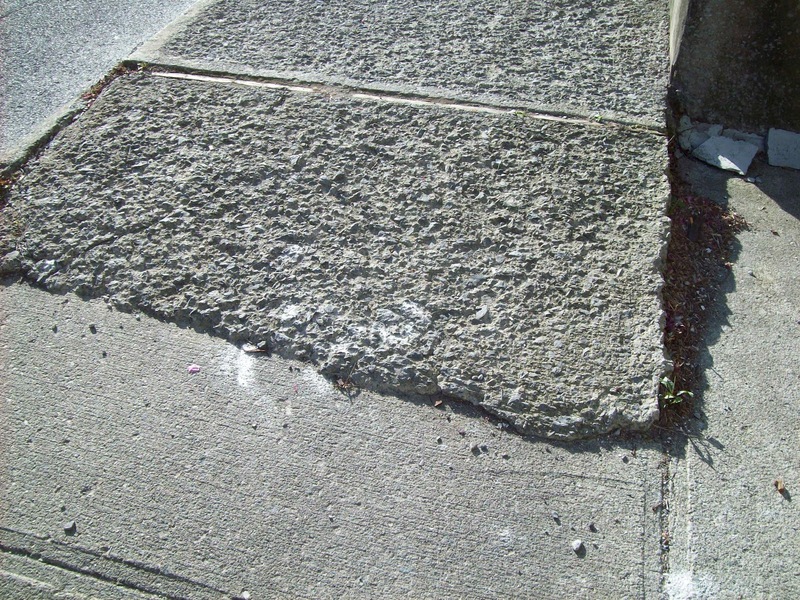 Victor Mendolia just posted Part 4 in his series about his experience living at 336 West 19th Street: "No More Than a Squatter?" Gossips was just advised by Council President Don Moore that tonight's special meeting of the Common Council will take place in executive session--the public and the press will not be permitted to observe--and no action will be taken. As permitted by Chapter 12-4 of the city code, Council President Don Moore has just called a special meeting of the Common Council to take place tonight at 6 p.m. 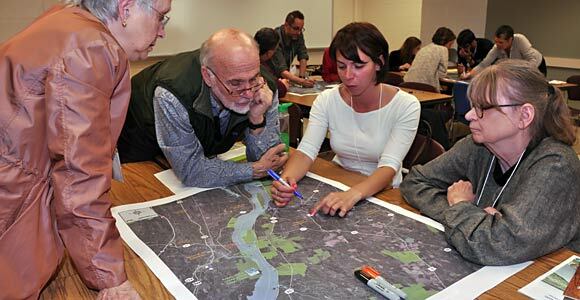 The stated purpose of the meeting is "to discuss Proposed Local Law Introductory No. 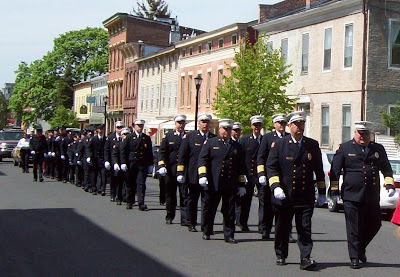 1 of 2012--Authorizing the Execution of a Collective Bargaining Agreement between the City of Hudson and Hudson Police." To the surprise of some, the Council postponed voting on the police contract last Tuesday and instead went into executive session to discuss it and the unspecified "real estate transactions." 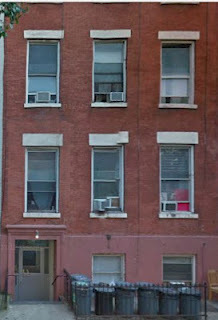 Victor Mendolia just posted Part 3 in his series about his experience living at 336 West 19th Street: "Where the F@%$ Is My Stuff?" Here are the links to Part 1 and Part 2. 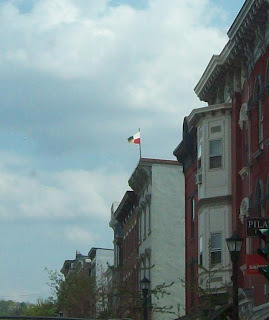 At one time, as this picture shows, flags flew from tall vertical flagstaffs mounted on the roofs of buildings up and down Warren Street. Vincent Mulford continues the tradition on his building at 417-419 Warren Street. When Gossips asked Mulford about the flag now flying atop his building, he explained that he buys ship's flags to display whenever he can. He told how he had found a wood stump on the roof of his building, which turned out to be the base of a flagstaff. The staff went down through the roof and was attached to the ceiling rafters. 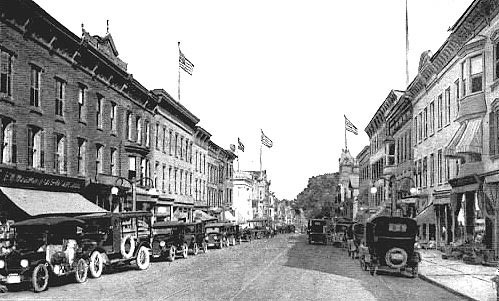 The stump reminded him of a ship's mast, and he speculated that the flagstaffs of Hudson may have been crafted by the city's shipbuilders. The flagstaff that Mulford now uses is a mahogany ship's mast he found in Maine. Comparing its scale with that of the stump he discovered, Mulford concludes that the original flagstaff was at least twice as tall as the one he now has on his roof. Lynn Sloneker has a post on her blog, Unmuffled, about a report by the New York State Joint Intervention Team on HCSD's Montgomery C. Smith Intermediate School. Here's a preview of the content: "The team found the grade 3-6 school has failed to make sufficient academic progress and it is unlikely to improve its performance under the current structure and organization." Read more at "Report: Expectations for students are low." Victor Mendolia just posted Part 2 in his series about his experience living at 336 West 19th Street: "Galloway Buys the Building." If you missed it, here's the link to Part 1. Reacting to Audra Jornov's blog post last week revealing the salaries of the five highest paid employees of the City of Hudson, Lynn Sloneker compares their salaries with the highest paid employees in the Hudson City School District on her blog, Unmuffled. Over the years, the promise of a luxury hotel in Hudson has been dangled before us more than once. There was the plan to build a new hotel at Fifth and Warren streets, and Richard Cohen's plan to turn the buildings he owns at Fourth and Warren into a hotel, but alas, for various reasons, neither has came to fruition. 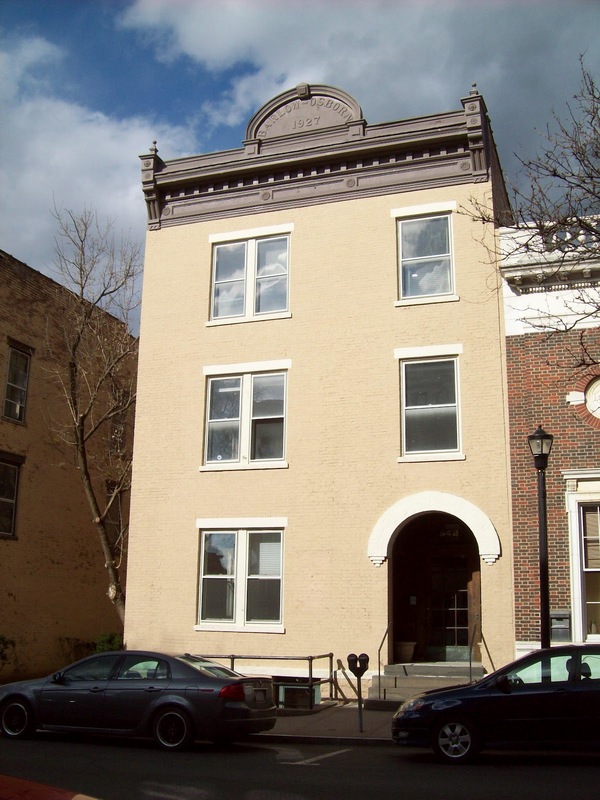 Most recently, Duncan Calhoun and Russell Gibson, proprietors of The Croff House on Willard Place, presented to the Planning Commission their plan to turn 542 Warren Street into a sixteen-room boutique hotel, with such amenities as working fireplaces in every room. Their purchase of the building, they told the commission, was contingent on their getting site plan approval and working out a deal with the City of Hudson to lease sixteen parking spaces for their guests in the municipal lot behind the building, but before either of these things could be achieved, the owner, according to several reliable sources, had a change of heart about selling the building and took it off the market. It's nice to imagine that the more affluent communities in the county to our south do a good job of protecting their historic resources, but that's not always true. A reader alerted me to a story from the British press about the abandoned Halcyon Hall in Millbrook. 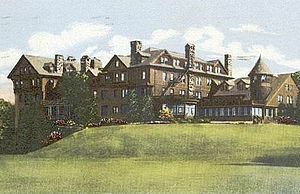 Designed by James E. Ware, who designed the Stone Building at Mohonk Mountain House, Halcyon Hall was built as a luxury hotel in 1893. In 1907, it became the main building of Bennett College, a two-year college for women, which had been founded seventeen years earlier in Irvington, NY. The college closed in 1978, and Halcyon Hall has stood abandoned ever since. The story in the Daily Mail has pictures taken recently of the interior of the once grand building as it awaits its imminent demolition. On his blog Diamond Street, Victor Mendolia plans to tell the story of his experience living in this building on West 19th Street in Manhattan, which was acquired, while Mendolia lived there, by Eric Galloway and his Lihtan Group. The first of a six-part series, which Mendolia is calling "My Time as Eric Galloway's Tenant," appeared today. Gossips will be following the whole series. Click here for Part 1. 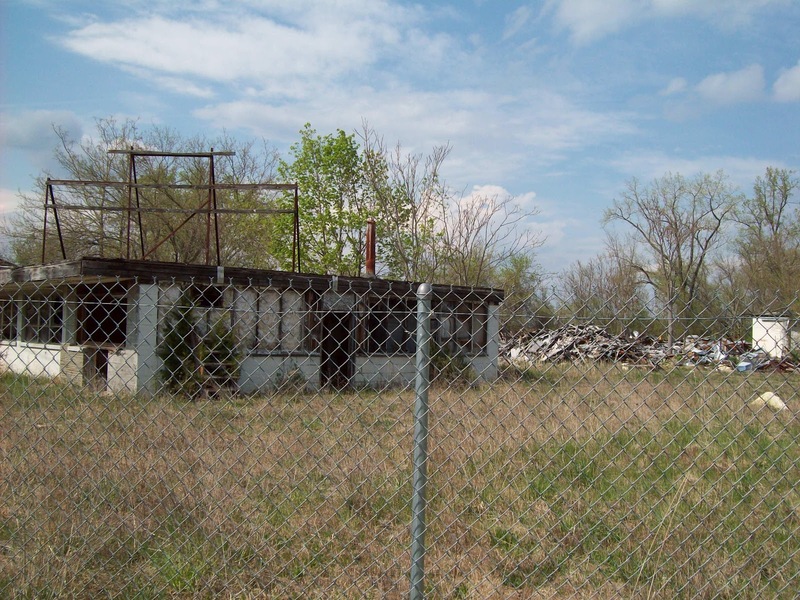 In April 2007, the City held a public meeting to talk about what to do with the brownfield site that was once Foster's Refrigeration, on North Second and Dock streets. According to reports, "about 2,600 cubic yards of lead-contaminated subsurface soil and 100 cubic yards of PCB-contaminated soil" had been found at the site, and remediation would cost more than $1 million. Five years later, Mayor William Hallenbeck has an idea for how to use the site: make it a dog park. The transformation would involve cleaning the entire area and bringing in new topsoil--capping the site rather than remediating it. Dog park advocates Sarah Sterling and Robert Rasner are enthusiastic about the possibility. Rasner enumerated the advantages of the site for Gossips. It is several thousand square feet and is already surrounded by a fairly new six-foot chain link fence. 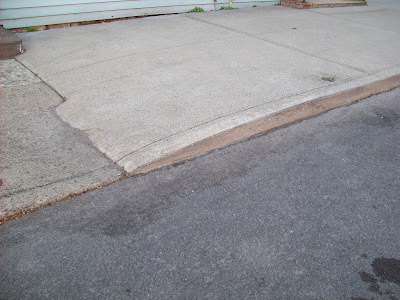 In its present condition, it is an eyesore and a blight, and any use that would clean it up would be welcome. There is ample space to create separate areas for large dogs and small dogs. 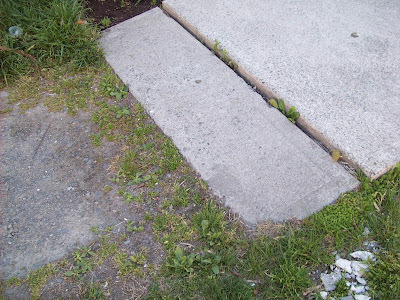 It is large enough to ensure that dogs can exercise there and not just use it to relieve themselves. The site is not located in a high-density residential area where neighbors might be disturbed by barking dogs. 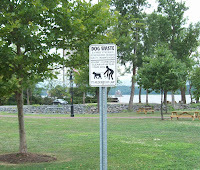 It is near an area--the capped former county landfill--where some people already go to exercise their dogs off leash. The site has an existing water supply. If the site is to be a dog park, however, much work lies ahead. 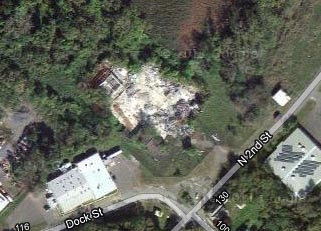 Jim Bent, who demolished two of the three Hudson River Knitting Mill buildings on North Front Street in 2009, reportedly started demolishing the buildings on the Foster's site but left the job unfinished. A significant amount of demolition work remains to be done, and enormous amounts of debris need to be removed from the site. "If these challenges can be met successfully," says Rasner, "we have the opportunity to have a first-class off-leash park for the use of residents and visitors." He anticipates the result will be "happier residents and their dogs, as well as a cleaner city." to the anonymous reader who slipped some cash through the mail slot here at Gossips Central this morning, specifying on the envelope the purpose but not revealing the source. Rick Scalera, who identifies himself only as Fifth Ward Supervisor and not as a special adviser to the Galvan Initiatives Foundation, has a letter to the editor in today's Register-Star, entitled "Library Limbo," in which he responds to previous letters on the subject of the library's current location uncertainty from Norman Posner and Frank Rees. What Makes a Park a Park? 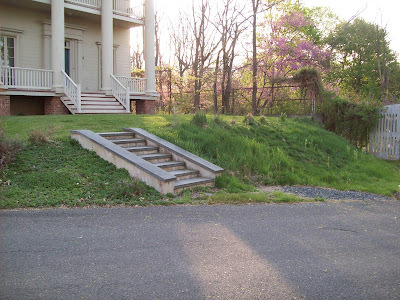 On April 11, 2012, a decision was finally rendered in the lawsuit that has been going on since 2004 over the sale of land on Willard Place by the City of Hudson to Eric Galloway and his Lihtan Company. Tom Casey has the story in today's Register-Star: "2004 suit over land sale on Willard Place settled." Galloway needed the land so that the two houses he had built behind 317 Allen Street, fronting and intruding on what had been, from its creation in 1874 until 1969, the private neighborhood of Willard Place, could have access to the street they faced. Don Christensen, who with his wife owns 8 Willard Place, opposite the new houses, brought a suit against the City for selling the land, maintaining that it was park land, part of what had originally been Willard Park, and could not be sold without an act of the state legislature approving the sale. When Christensen initiated his lawsuit in 2004, the City countered by bringing a lawsuit against him, declaring that the front porch on Christensen's 1893 Colonial Revival house encroached on the public street and ordering him to have it removed. 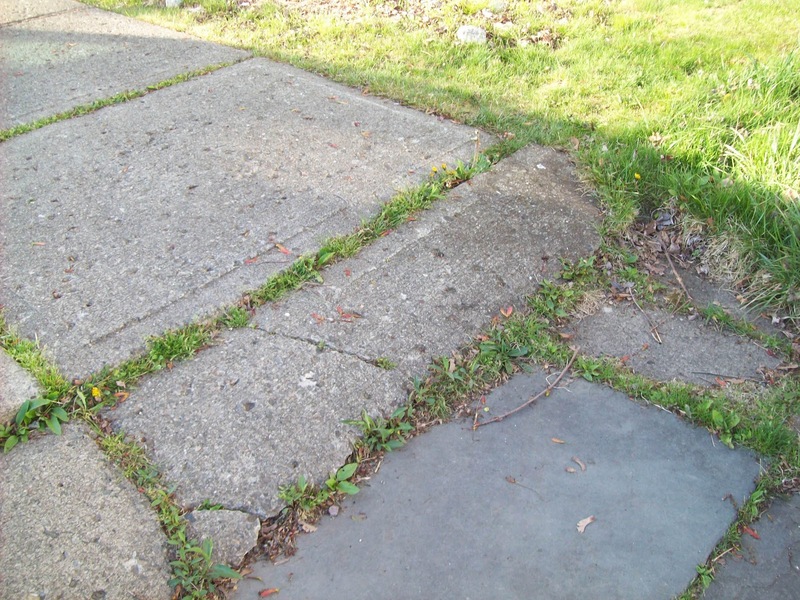 At that point, Willard Place had already been designated a historic district by the Historic Preservation Commission, so the lawsuit, brought by the City, sought to force a resident to take an action in violation of its own preservation law. When this was brought to the attention of the Common Council Legal Committee, Jack Connor, then city attorney, said defensively, referring to Christensen, "Well, he started it." The City's lawsuit against Christensen was dismissed in New York Supreme Court in November 2007 by Justice Mary O. Donohue, who in her written decision used such phrases and words as "grasps at straws" and "fanciful" to describe the arguments presented by city attorney Robert Gagen, who had inherited the suit. Meanwhile, a trial in Christensen's lawsuit against the City was heard in July 2010 by Judge Paul Czajka, but Czajka resigned from the bench before making a decision in the case. The case eventually went to Justice George Ceresia, who, instead of retrying the case, heard oral argument in November 2011, and rendered a decision on April 11 based on the record of the trial. The decision finds that the plaintiff, Christensen, "failed to satisfy his burden of establishing that the disputed parcel constitutes parkland subject to the public trust doctrine." The decision makes no reference to the two documents which Christensen says form the basis of the case. The first is the conveyance deed from 1969, signed by all the Willard Place property owners, which conveyed two parcels to the City: the street and the park. According to Christensen, this deed follows the language of the original deed that created Willard Place in 1874 as two parcels: the street and the park. The other document is the minutes from the 1969 meeting when the Common Council accepted specifically the sixty-foot wide street that runs from Allen Street to the front of Christensen's property. The minutes mention only the street, not the park. 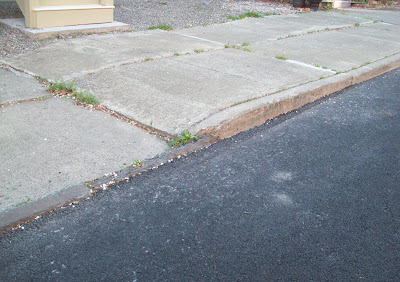 There are a variety of laws and regulations that need to be followed when a municipality takes possession of a street, which prescribed the action of the Common Council in 1969, but there are not similar laws and procedures regarding the acceptance of park land, which would explain why the Council action makes no mention of the park parcel. The two documents--the conveyance deed and the Common Council minutes--were the evidence used by the attorney for the New York State Office of Parks, Recreation and Historic Preservation to confirm for Christensen that Willard Park was indeed a park under New York State law. In defining a park, the decision appears to support the City's premise that no area can be considered public park land unless "playground equipment, picnic tables, benches, garbage receptacles or signs" are present and the Youth Department has sponsored events there. Christensen also pointed out that the decision references property tax assessment maps, which he says are rarely used in property disputes except in the absence of deeds. In this case, there are deeds, and it is the deeds that define the park. Christensen provided Gossips with a copy of the first page of the deed for 325 Allen Street, which makes specific reference to Willard Park in its definition of the property's boundaries. Speaking of the documents and deeds, Christensen told Gossips: "The Court seems not to have addressed the content of these public documents. Does that mean that they are now considered fraud or incorrect or no longer valid? And, if so, do these public documents now have to be altered or expunged from the public record? It's very confusing. There are unanswered issues." The banner on the print edition of the Register-Star boasts, "Serving Columbia and Dutchess Counties Since 1785." This morning, I happened upon this little item, which appeared in the Hudson Evening Register on April 7, 1914, and explains how our current local newspaper traces its lineage from Ashbel Stoddard's Hudson Weekly Gazette, founded in 1785, the year the City of Hudson was incorporated. On April 7, 1785, Ashbel Stoddard and Charles H. Webster instituted the Hudson Weekly Gazette. A year later Mr. Stoddard became sole owner. 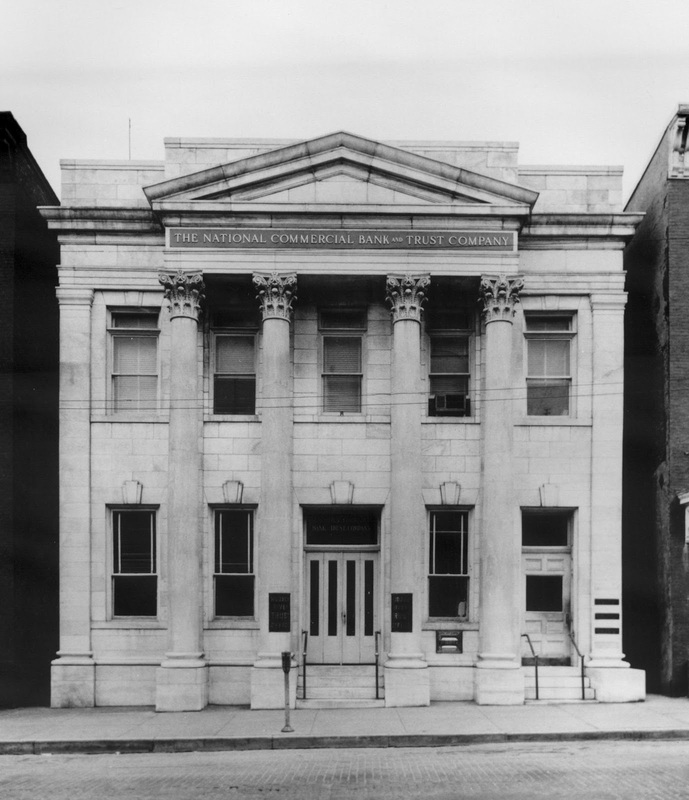 The printing office at that time was located on the south-east corner of Warren and Third and long known as the "Stoddard Corner." The Gazette was reorganized in 1824 by Oliver Wiswall, who was Mayor of Hudson in 1827-28, and other prominent Democrats. The Gazette came into possession of P. D. Carrique in 1834. It was later sold to R. F. & M. P. Williams in 1857 and in 1861 came under the sole management of M. P. Williams, who later founded the Evening Register. Both of the papers are now printed by the Record Printing and Publishing company. In our "40 years ago" notes from the Register of 1874 the death of Judge Edmonds is recorded, who had 50 years before taken the editorship of the Gazette. Sam Pratt has a new post on his blog reminding readers that, despite the Register-Star's claim, Bill Hallenbeck has not "spent his entire professional career in public service, from his stint in law enforcement with the Hudson Police Department and Columbia County Sheriff's Office to his two years as Third Ward Supervisor." What wasn't mentioned is the time he spent doing PR work for St. Lawrence Cement, now known as Holcim. On March 8, the Board of Supervisors Human Services Committee decided to solicit proposals for what is now being called "emergency/transitional supportive housing." Gossips predicted at the time that the Lantern Organization would be stepping forward, and they did. In today's Register-Star, Nathan Mayberg reports that there are five agencies interested in providing emergency/transitional supportive housing for Columbia County: Eric Galloway's Lantern Organization, Catholic Charities, Maranatha Human Services, the Mental Health Association of Columbia-Greene Counties, and St. Catherine's Center for Children. In today's Register-Star, Tom Casey has an interview with Mayor William Hallenbeck, assessing his first hundred days in office: "100 days deep, with goals aplenty." Of particular interest is what Hallenbeck has to say about the proposed Civic Hudson project: "It would be nice if the city could separate the two [police/court building and supportive housing]. . . . But I think the benefits totally outweigh the negatives . . . "; and about Eric Galloway, who he thinks is a "great asset to the city": "I would say he probably deserves the key to the city at this point." Sam Pratt has a new post on his blog, "Down on the corner"--the first in a series of posts about the truck routes in Hudson and our perpetual but fruitless desire to get rid of them. Today's post focuses on the efforts made in the late 1990s to reroute the trucks. 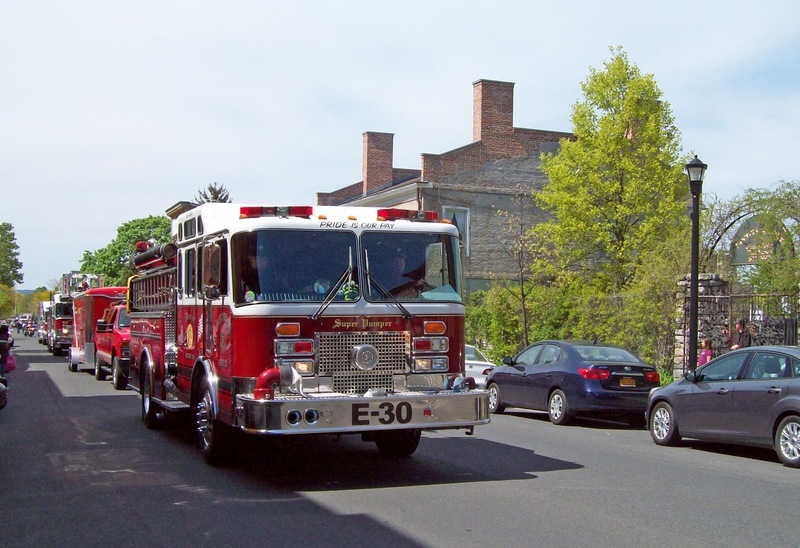 Yesterday, a reader snapped this picture of a haz-mat truck behind the Armory. On Wednesday, another reader witnessed an enormous fuel tank, described as being twice the size of a car, being removed. The question is what was stored in that tank--fuel to heat the building, or, when the building was actually an armory, was gasoline to fuel vehicles stored there? 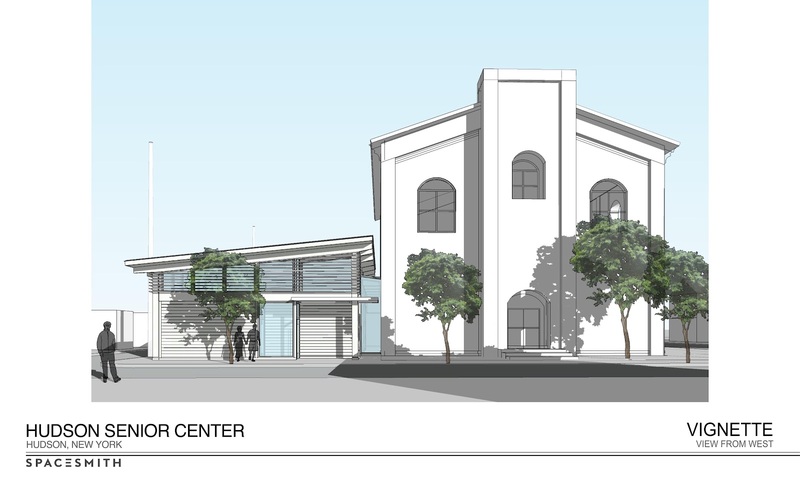 The proposed senior center was the subject of consideration at two meetings this week. On Tuesday night, the Common Council reviewed the completed LEAF (Long Environmental Assessment Form) for the senior center project--a 21-page document with as many more pages of appendices and attachments--and unanimously made a Negative Declaration: The project would have no significant adverse environmental impacts. Last night, Mike Sullivan of Crawford & Associates presented the project's application for area variances to the Zoning Board of Appeals. 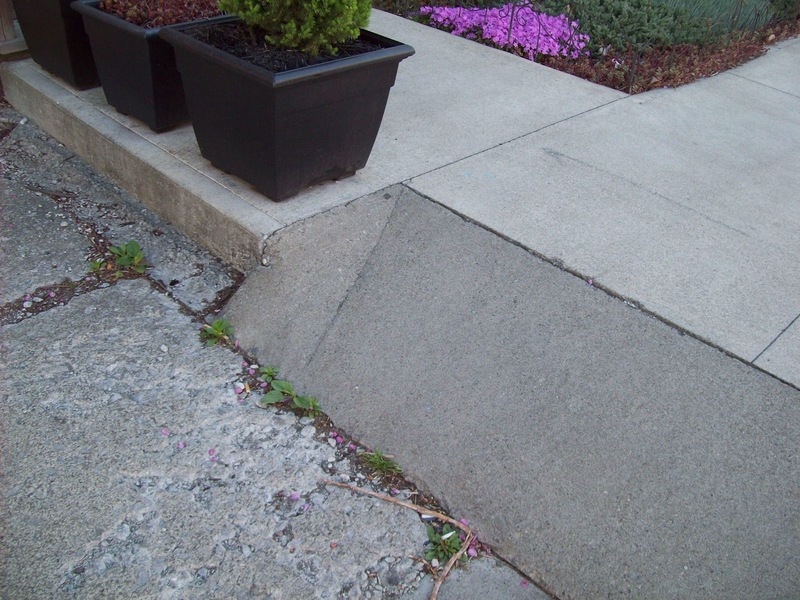 Area variances are required because of setbacks and lot coverage. Surprisingly, at last night's meeting, after so much has been written about the senior center project in the press, the members of the ZBA seemed to have little or no prior knowledge of it. When it became clear that the proposed new building would sit on the site of what is now a parking lot, there was lots of concern about parking. Sullivan explained that there was street parking on Union Street, along the south side of the original historic building, and there was the municipal parking lot on the other side of Cherry Alley, where the plan is to designate two additional parking spaces as handicapped spaces and remove the guardrail to provide access to the parking lot from the alley. Theresa Joyner wanted to know if the historic church building was going to be renovated in this project. Kathy Harter asked why there was going to be an elevator in the building. Someone else wanted to know if seniors or seniors and youth would use the new building. Toward the end of the meeting, ZBA member Mary Ellen Pierro said of the senior center, "We really need this"--an opinion that most city officials seem to accept as a truism but many taxpayers question. According to reports, about 35 people currently participate in the City's senior program, which offers a total of 9 hours of programming a week. When questions about parking, traffic, fugitive light and noise, and overall impact on the adjoining residential neighborhood arise, current use is cited, with the implication that no one expects that to increase or change significantly when the new building is completed. So it would seem that the City is poised to spend $780,000 to construct a senior center that will benefit 35 people. That's a little more than $22,000 per person--oddly, about the same number you get when you divide the Hudson City School District's annual budget by the number of students it serves. On April 11, Don Tillson chair of the Planning Commission proposed that the Planning Commission and the ZBA hold a joint public hearing on the senior center on Wednesday, May 9, after which each panel, in succession, would hold a regular meeting to make its decision. It is not clear when the Planning Commission intended the public hearing to begin, but last night, the ZBA set 7:30 on May 9 as the time for its public hearing and subsequent meeting. When there is clarity about the meetings and times, Gossips will report it. 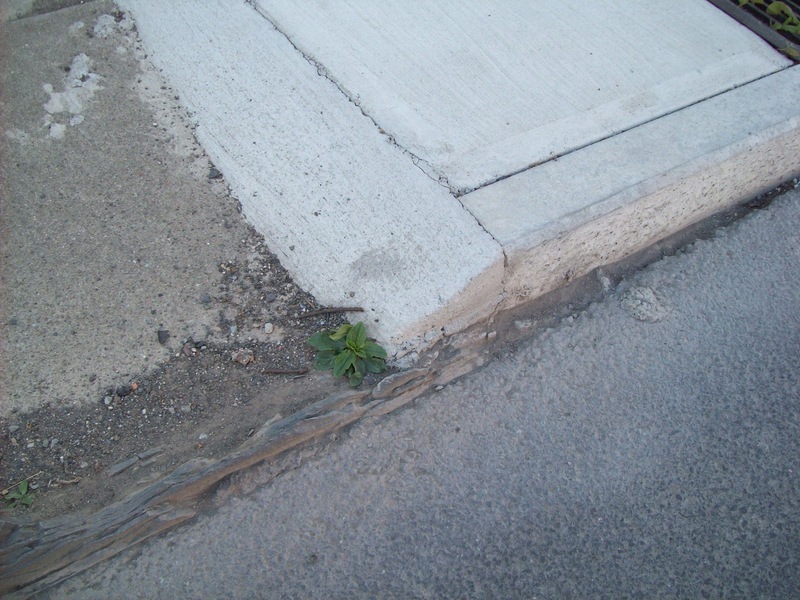 Mark Orton started the conversation about uneven sidewalks on Monday with a post on his blog criticizing the new sidewalk in front of Wunderbar and The Crimson Sparrow. 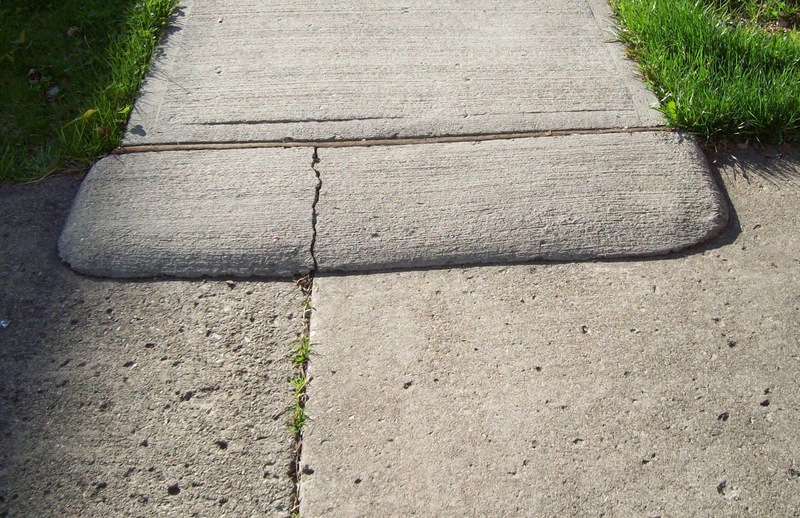 The discussion of sidewalks was taken up at the meeting of First Ward residents on Monday night. 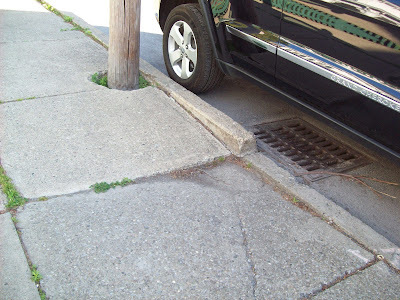 Today, Orton has a new post on his blog calling for stricter code enforcement and "vigorous action by city officials": "Sidewalks in Hudson--Dangerous for Lack of Code Enforcement and Common Sense." Having walked literally hundreds of miles over the same south side turf while walking William twice a day for the past thirteen years, I have a different take on the sidewalk situation. 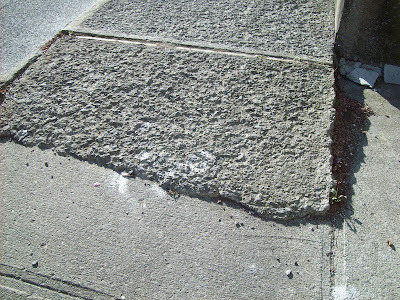 I think the sidewalks that are most successful, from a dog walker's point of view, are those that don't follow the code. They are the ones where the original bluestone has been reset or where new bluestone, a combination of bluestone and brick, or just brick have been installed. 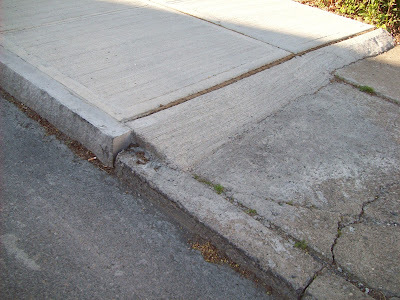 With a few exceptions, those sidewalks are at the same level as the sidewalks that they abutt at either end. What I fault is the code that requires six-inch curbs, thus pretty much ensuring that any new sidewalk will not be at the same height as the sidewalk that already exists. 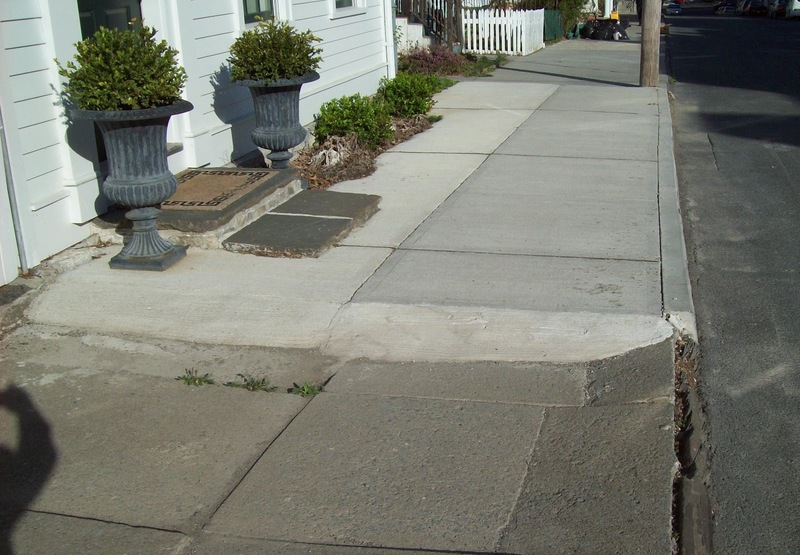 Unless the City undertakes to replace all the sidewalk in neighborhoods whole blocks at a time, it's a fantasy to think that eventually all sidewalks will be of uniform height. Some of the sidewalks that are disproportionately high were clearly installed thirty or more years ago. 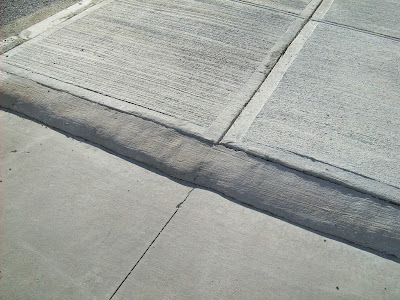 The code requirements for sidewalks seem to reflect the same yearning to make the city different from what it is that inspired the code requirements for setbacks. I was once told by someone who was involved in the process of adopting zoning back in the 1960s that the setbacks in the code, which are appropriate to a suburban setting but don't reflect what already exists in the majority of neighborhoods in Hudson, were deliberately adopted because it was believed (and hoped) that eventually all the old buildings would burn down or be demolished, the new buildings would be built farther back from the street, and the streets could be widened. Whether the solution to the sidewalk problem be enforcing the code or changing it, all the talk about sidewalks inspired me to take the camera along on William's morning walk yesterday and photograph some of the more striking examples of the sidewalk height change on our route. "Conceived in Iniquity and Born in Sin"